"A homage to traditional European beers brewed for quenching the thirst of farm workers of "Saisonaires." A unique Belgian Saison yeast is used to impart a mixture of spice, fruity and earthy notes along with a lip smacking palatability." 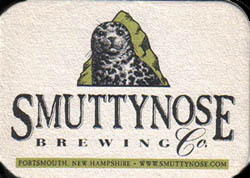 -- Smuttynose Brewing Co. The Farmhouse Ale pours a dark yellow to medium amber color, topped off with a small, off-white fizzy head. No lacing behind a fully diminishing head. Body is hazy with a significant amount of sediment suspended almost like jelly. Nose is complex. Notes of perfume and flowery hops, specifically roses, fruity hops in the form of Washington apples, and a sweet, doughy yeast aroma. Initial taste is a medium sweet which carries right through the finish. Long duration on the mouth. Soft carbonation, medium body, and a creamy texture left at the finish. Reviewer's notes: "Holy chunkiness, sweet on your lips, good - really good, spicy - very spicy, it's good, lots of particles"
Reviewed on July 29, 2006.